Cover of JPMC's publication announcing its philanthropic investment in Detroit. The Association of Fundraising Professionals Greater Detroit Chapter is honoring JPMorgan Chase this year with the Outstanding Corporation Award in recognition of the company’s extraordinary philanthropic investment in the city and its nonprofit organizations. The award will be presented at the 27th Annual National Philanthropy Day Dinner on November 8 at The Henry Hotel in Dearborn. Each year the fundraising and nonprofit community gather to celebrate National Philanthropy Day and to honor metro Detroit’s philanthropists and volunteers. 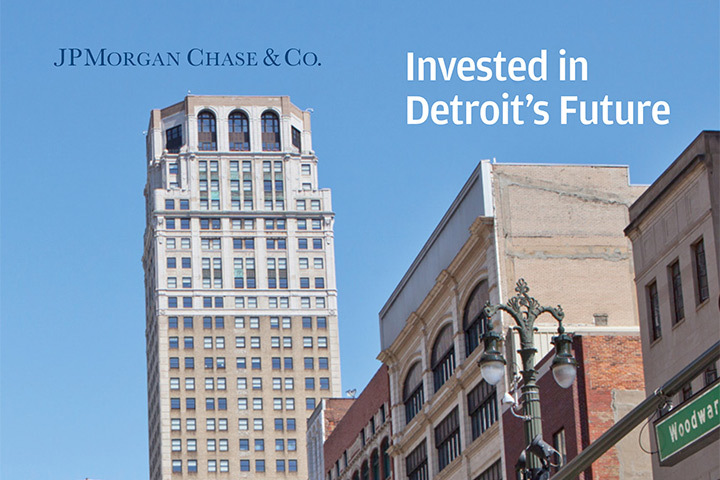 In 2014, JPMorgan Chase (JPMC) announced its $100 million, five-year investment Detroit’s recovery. JPMC exceeded that investment in three years and now expects to invest $150 million in the city by 2019. This investment strategically focuses on revitalizing Detroit through community development, blight elimination, job training, small businesses development, and long-term economic growth. To realize these initiatives, JPMC is partnering with and supporting numerous nonprofit organizations in the city. This support is not only financial. It includes the JPMC Detroit Service Corps, which provides teams of JPMC volunteers to collaborate with community-based organizations and lend their expertise to address challenges and build capacity. “JPMorgan Chase’s philanthropic commitment to Detroit has been transformational for the city and truly defines what it means to be a good corporate citizen,” said Steve Ragan, Senior Vice President for Development & External Relations at Southwest Solutions, which nominated JPMC for the award.